Artafon PG 02 – PIPE DIFFUSER AND ENGINE GUARD KTM HUSQVARNA EXC TE 2T 250/300 2017 2018 2019 TPI. Fits only with the OEM diffuser, not bent and distorted / destroyed. Large drain hole at the lowest point. Will fit all models of Tiger 1050's including new Tiger Sports! TIGER 1050. TIGER SPORT > 2019. ndClass depending on what service you select. These bags are suitable for adventure bikes or other motorcycles with similar crash bars at the front of the bike. The bags may also be suitable for mounting to other parts of a motorbike and could be strapped onto the top of rear hard panniers or other larger luggage. After 3 years, they had over 100 bikes and 3 types of protectors in their product range. Crash Bars Suzuki DR 800 BIG. They continue to work with racing riders, teams and professional bikers and have important knowledge of making and improving all their products. HEED Poland. Painting: powder coated. All our products have 2 years warranty. Professional performance Cutting: laser. Artafon PG 02 – PIPE DIFFUSER AND ENGINE GUARD KTM HUSQVARNA EXC TE XCW SX 2T 250/300 2017 2018 2019 TPI. Fits only with the OEM diffuser, not bent and distorted / destroyed. Large drain hole at the lowest point. honda crf 1000 africa twin 2016 RG Lower Engine Crash Bars. Condition is Used. Dispatched with Royal Mail 2nd Class. Excellent condition with a selection of nuts bolts spacers and washers but letting u know... There is a few bolts missing but only standard bolts so easy to source. The Rear Crash Bars Yamaha XVS 1100 Drag Star will fit ALL AGES of Classic & Custom models. I bought a stash of parts from a dealer and included was this set of near new genuine Indian closeouts that fit the Indian mustache type highway crash bars engine guards. They will not fit the standard large crash bars, only the Indian mustache bars such as on the Springfield. Made to replace Yamaha: STR-5VN31-20-00. The unique fusion of creative engineering and excellence make us the proud manufacturer of The Multibar. the original patented combined engine guard and highway peg. LINDBY CUSTOM INC..
2001-2014 Honda GL1800 Gold Wing. This is an authentic Honda part exact fit for this model. CALIFORNIA PROPOSITION 65. INTERNATIONAL GUIDELINES. ONE NEW ENGINE CRASH GUARD SET. ONE ENGINE CRASH GUARD SET as shown is what you will receive. WE PREFER NOT TO BE PAID WITH ECHECKS. However, this is not cost effective for us as our pricing is aggressively competitive. This marine grade stainless steel guard will protect the downtube from much of the spray, mud and stones thrownup by the front wheel. Also helping to stop the build up of dirt on the front of the engine and debris collecting between the engine and the bash plate. The unique fusion of creative engineering and excellence make us the proud manufacturer of The LINBAR, the original patented combined engine guard and highway peg. The LINBAR: PATENT# D361311. Tech Note: Will not fit the Ultra Limited or any models with liquid cooled heads. Fits Honda VT 700C Shadow model. - No modification needed, mount on the bike with existing hardware, mounting bolts included. These are exclusively for UK orders. It must be fit for resale (ie no scratches or cut wires etc). To Fit Harley Davidson Touring models 1997-2008; Also fits models equipped with fairing lowers. 1X Guard Bar ( As Pictures Shown ). for HD Part# 49184-97. Our warehouses are in Rancho Cucamonga,California, United States. HEED Poland. Painting: powder coated. All our products have 2 years warranty. Cutting: laser. 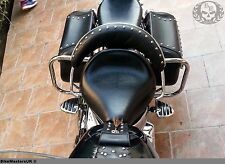 To Fit Harley Davidson Touring Models 1997-2008; Also Fits Models Equipped With Fairing Lowers. 1X Guard Bar With Screws( As Pictures Shown ). Color: Matte Black. Our warehouses are in Rancho Cucamonga,California, United States. Tusk Crash Bars are perfect for your dual sport and adventure motorcycle riding needs. Tusk Engine Crash Guards are made from tough 1" powder-coated steel tubing so they will hold up on all your adventure motorcycle rides. HEED Poland. Painting: powder coated. All our products have 2 years warranty. Stylish design, not only protects but also looks good on the motorcycle. Tusk Crash Bars Engine Guards Black. Fits KAWASAKI KLR650 Models From 2008-2018. Tusk Crash Bars are perfect for your dual sport and adventure motorcycle riding needs. Tusk Engine Crash Guards are made from tough 1" powder-coated steel tubing so they will hold up on all your adventure motorcycle rides. Honda Shadow Aero VT400 2004-2011. Honda Shadow Aero VT750 2004-2011. Honda Shadow Aero VT750C 2004-2011. 1 Engine Guard Crash Bar. Our warehouses are in Rancho Cucamonga, California, United States. 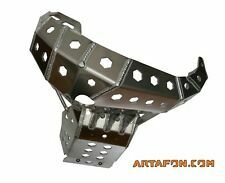 ARTAFON SP05 - Aluminium engine guard skid plate KTM exc 250 / 300 EXC 2T model 2008-2016. The unique fusion of creative engineering and excellence make us the proud manufacturer of The Multibar, the original patented combined engine guard and highway peg. PATENT# D548142. Fat Bob FXDF. For Harley Davidson Dyna 2006-2017 Models. Our highway crash bar make riders more comfortable. Strong steel tube give more protection. One- piece engine guard. Low Rider FXDL. Super Glide FXD. GIVI TN2130 MOTORCYCLE ENGINE CRASH BARS YAMAHA MT-07 2018. 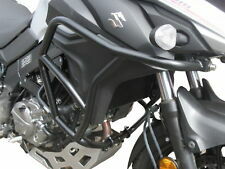 GIVI ENGINE GUARDS FOR MOTORCYCLE MODEL:MT07 - MT-07. GIVI ENGINE GUARDS FOR MODEL YEAR:2018 - 2019. GIVI ENGINE GUARDS COLOR: BLACK. GIVI PART NUMBER:TN2130. 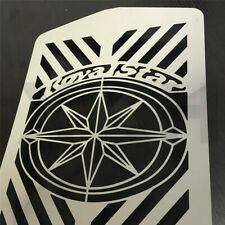 YAMAHA MIDNIGHT & VSTAR XVS 1300 STAINLESS STEEL ENGINE GUARD WITH BUILT IN PEGS. It is made from stainless steel tubing (32 mm x 2.5 mm). HEED Poland. No interference with the structure of the motorcycle. Painting: powder coated. All our products have 2 years warranty. Cutting: laser. Brand new chrome, forged highway bar covers that will fit Victory motorcycles that have forged highway bars installed (such as some Cross Country, Cross Roads, Magnum, and Hardball models). Box has been opened for pictures but items were never installed. Instructions included. Buyer responsible for verifying fitment needs before purchasing. No returns. Free shipping to lower 48 US states. Buyer responsible for full shipping cost to Alaska, Hawaii, or international shipping. SO JUST BE SURE YOU HAVE A 2000 - 2017 SOFTAIL MODEL LIKE BELOW WITH FLOOR BOARDS. DOES NOT FIT 2018 AND NEWER SOFTAIL. Softail Slim FLS. Softail Slim S FLSS. Softail Deluxe FLSTN. THIS CRASH BAR ,, ENGINE GUARD FITS SOFTAILS WITH FLOOR BOARDS LIKE BELOW. CrossPro DTC Engine Guard. Yamaha YZ250F 2014. Yamaha YZ250F 2015. Yamaha YZ250F 2016. Yamaha YZ250F 2017. Yamaha YZ250F 2018. With humble beginnings, a few mates got together with the vision to tackle motocross gear online in Australia. Crashbar to protect your fairing, fuel tank and frame in case of a fall over Very easy to mount Fitting kit included No modifications of the fairing or the frame necessary Not fit for motorcycles with double clutch Mounting hardware, mounting instructions . HEED Poland. Basic model of crash bars is the simplest version of piping for this motorcycle and it's construction doesn't allow to install upper crash bars. Painting: powder coated. All our products have 2 years warranty. 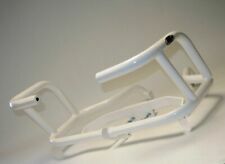 The set includes Bags dedicated to these HEED crash bars. HEED Poland. These saddlebags fill space in the upper crash bars and do not extend the motorcycle. Bags are made of waterproof material (rubberized inside) with sealed zippers (During heavy rain seams may leak water.). RD-Moto was established in 2001 and started producing crash protectors. Unique bolt designed to bend on impact and not snap. Crash Bars. Crash Protection. Fairings & Carbon. Color: Black, White, Silver, Orange. Upper crash bars for Triumph Tiger 800 / XR / XC motorcycles manufactured in 2015 - 2018. They protect upper parts of the motorcycle. They are a smaller alternative to Bunker version. They are compatible with Triumph auxiliary lights. Crash bars have 4 mounting points per side, which makes them very strong. Each motorcyclist riding in terrain will appreciate such protection covering almost whole front part of the motorcycle. HEED Poland. This model of crash bars fits to all motocycles Triumph Tiger 800, 800 XC, 800 XCX, 800 XCA, 800 XR, 800 XRX, 800 XRT manufactured since 2015. HEED Poland. Painting: powder coated. All our products have 2 years warranty. DTC enduro engine guard. Suzuki RMZ250 2015. Suzuki RMZ250 2016. Suzuki RMZ250 2017. Suzuki RMZ250 2018. With humble beginnings, a few mates got together with the vision to tackle motocross gear online in Australia. Upper crash bars for Triumph Tiger 800 / XR / XC motorcycles manufactured since 2015. They protect upper parts of the motorcycle. They are a smaller alternative to Bunker version. They are compatible with Triumph auxiliary lights. After 3 years, they had over 100 bikes and 3 types of protectors in their product range. They continue to work with racing riders, teams and professional bikers and have important knowledge of making and improving all their products.